Not your average pumpkin pie! Mooncakes are served in China to celebrate the Mid-Autumn festival. This November, families throughout the United States, Canada, and several Caribbean Islands will gather together to celebrate Thanksgiving. What began as a day of giving thanks for the year’s bountiful harvest has transformed into a reason to bring family, friends, and loved ones together for a beautiful meal. Countries around the globe celebrate their own versions of Thanksgiving each autumn! They may not serve pumpkin pie or fry turkeys, but each celebration is an expression of renewal, gratitude, and togetherness. Many of the pilgrims on the Mayflower traveled from Leiden in The Netherlands. Subsequently, colonial American life was highly influenced by Dutch culture, from the particular style of chairs to the way homes were constructed. On the fourth Thursday of November, the people of Leiden celebrate the American settlers with a non-denominational church service. Afterward, they enjoy cookies, coffee, and homemade apple pie. Want to try your own traditional Dutch dish this Thanksgiving? Give delicious Stamppot a try! This savory dish is comprised of mashed potatoes and an array of many delicious veggies such as kale, sauerkraut, spinach, turnips, and more. November 23 is marked as a national holiday in Japan, Labor Thanksgiving Day! The celebration involves the traditional notion of gratitude with the ancient Shinto harvest festival, Niiname-sai where the Emperor thanks the Shinto deities for a prosperous year and prays for a bountiful year to come. Niiname-sai itself means “celebration of the first taste” and is not only an opportunity for family members to gather together, but it’s also a time to reflect on the labor movement and worker’s rights in Japan. Rather than laboring over a large Turkey, the Japanese take a moment to rest and share chocolates and candies with friends. The Erntedankfest, or harvest festival, marks one of the biggest celebrations of the year in Western Germany! There is evidence of Erntedankfest celebrations dating back thousands of years, and today it is traditionally celebrated the first weekend in October. Church services, farmer’s parades, and elaborate fairs, the Erntedankfest is a celebration that gives thanks for a year of good agricultural fortune and pays respect to the regional farmers. Instead of turkey, the Germans celebrate the Erntedankfest with roasted hen or goose. On the fifteenth day of the eighth month of the lunar calendar, the Mid-Autumn Festival is celebrated throughout China and parts of Taiwan, Singapore, and Indonesia. The festival takes places during the full moon, to signify family reunion, gratitude and to pay homage to the moon itself. 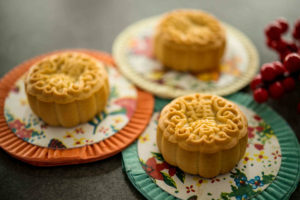 Making and sharing mooncakes is the biggest tradition of the Mid-Autumn Festival. The moon is of the utmost importance to the culture as they monitor the phases of the moon in accordance with seasonal changes and agricultural prosperity, which is why, on this day of honor, the celebration is commonly referred to as the Moon Festival. The rich pastries are enjoyed with family and friends, symbolizing completeness and reunion. Experience an exhilarating adventure on the Cosmopolitan, Explorer, Continental tours, and more! This entry was posted on Wednesday, November 21st, 2018	at 9:49 am	. You can follow any responses to this entry through the RSS 2.0	feed. You can leave a response, or trackback from your own site.